I'd like to implement a simple active visual system using the photoresistor and LED's on the Android ADK shield (see "Does not compute...") controlled by a program implemented on the Arduino Mega 2560 microcontroller. This requires flashing the LED's, and they are bright enough that it is pretty darned irritating if the flashing is visible. But if they flash fast enough we don't perceive it as flashing, just a bright light. Above the flicker fusion threshold of about 15 Hz a flashing light appears as a steady light. Movies and video have a 25 to 30 Hz frame rate to avoid flicker. There's a reason that 'flick' is shorthand for moving picture. How much processing can be done in one cycle through the program loop on an Arduino if the time permitted is less than about 1/20 second = 50 ms (milliseconds)? To get a feel for this, I could use a program with a loop containing one or several operations, to see how fast that runs. But without an oscilloscope I don't have a chance at measuring the frequency of the loop execution. Even with an oscilloscope it would not be clear which periodic signal corresponds to the loop frequency. 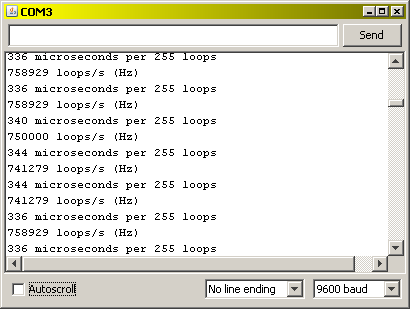 Each line corresponds to one pass through the loop, and there is a consistent 6 ms time difference between each of them. That's a good chunk of 50 ms, and worth worrying about. It might be that the micros() function takes longer to execute than millis(), and/or it takes longer to send and print out seven digits than it does four. I measured the time needed to execute these time functions (see appendix), and while they are different (1.3 and 3.3 microseconds, respectively) they are small compared with the serial send and print operations. 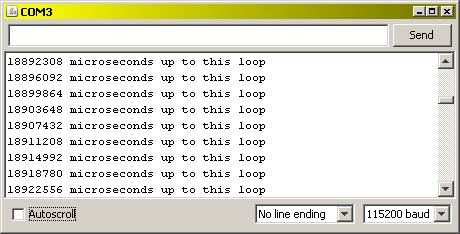 // At every loop cycle write time to the serial monitor. and the rest of the time taken for the loop is due to executing the function calls. Now it only takes about 3780 microseconds = 3.78 ms to send the 36 characters, more than 10 times as fast. I wonder if it can write faster if the serial monitor is not displayed? 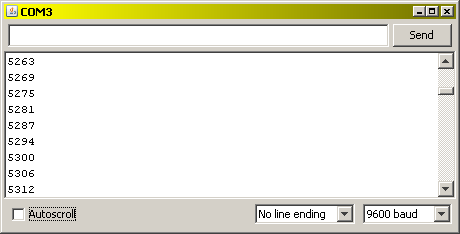 Perhaps the serial monitor needs to display a character or line before it will accept the next character or line of characters. At this baud rate the display update is jerky, displaying several lines with pauses in between. I don't know exactly why. // write stats to the serial monitor. Now we're talking fast; half a million loops per second, or 500 KHz = .5 MHz! Compare this with how long it took to do the serial calls a rate only about 264 loops/s -- about 2000 times slower. 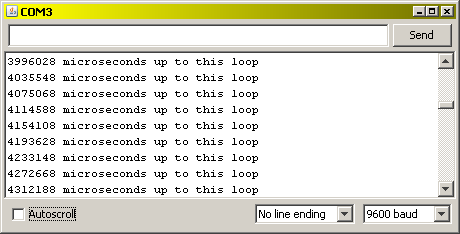 Exactly what operations were done during one loop, that took 2 microseconds to complete? The clock rate is 16 MHz, so it appears that about 32 clock tics are needed to carry out these operations. None of these short steps can be avoided, but can they be shortened? Yes. Note that the somewhat arbitrary value 32000 was used for the number of loops to average. This could have been less (say 10000), but it could not be much more. The Arduino is a 16-bit machine (the CPU operates on 16-bit chunks of data), and the type int is sized accordingly. A signed 16-bit integer, int, has the range [-32,768, 32,767] = [-2^15, (2^15) - 1]. 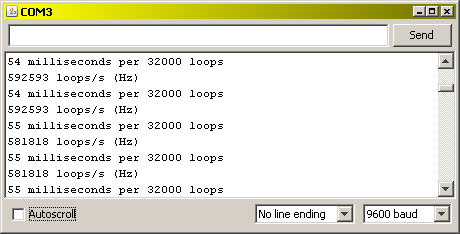 More loops could be averaged if the unsigned int type was used (up to 64,000), or the long or unsigned long type (up to 2,000,000,000 or 4,000,000,00 respectively). But if a longer integer type is used (for both the counter and the number of loops to average), the increment and compare function calls take longer, resulting in about 20% loss of speed, at 408 KHz. 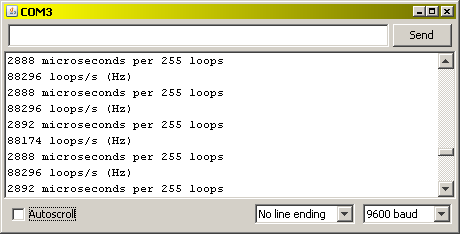 It loops at about 750 KHz = .75 MHz, corresponding to about 1.3 microsecond/loop. 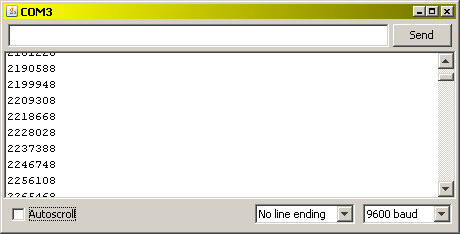 That's as fast as I could execute a loop that periodically reports timing. You might think that a CPU can anticipate that every time through the loop the same numbers (flFLOPvalue1 and 1.0001) are needed, and so the CPU will not have to retrieve the number from memory by keeping it in the register. It is true that modern compilers can sometimes produce optimized machine code that recognizes these regularities, and a CPU cache can reduce the need to go to memory. I don't know what optimizations occur in this case, or if they occur at all. But the compound multiplication operation *= can use a shortcut because only one register is needed for one of the arguments (flFLOPvalue1) and the result. A more general FLOP requires three registers, the two arguments and a result, like flA = flB*flC. Trying this out results in an almost identical result so it appears that this optimization is not used or doesn't result in a speed increase. There is a huge performance hit for division and some other operations (see list in appendix). Floating point division takes about three times as long as floating point multiplication, and integer division takes about 10 times as long as integer multiplication. That's a generous number of operations available in the blink of an eye. I think a robot with good visual comprehension is possible with the right programming, and efficient use of these operations. If the computational capacity is not exhausted using one eye spot (a photoresistor), then maybe several eyespots can be accomodated. Here's a short list of the time it takes to do particular operations, including integer operations. See operation_time_1 program below, which was used to find these values. "It takes about 100 microseconds (0.0001 s) to read an analog input, so the maximum reading rate is about 10,000 times a second." // Estimate operation(s) time on an Arduino CPU. // over 255 loop cycles, and report statistics. // an operation and run again. // The operations to be timed. // flTReport: // Time required for reporting alone. flTReport = 1.333; // Time required for reporting alone. // takes than reporting alone. // about 1.333 microseconds on Arduino Mega 2560. // Estimate loop time on the Arduino Mega 2560. // Don't do anything here, but this is where some operations would go.